Fun little blat at Melville in pretty much a true Sou'Wester, which is nice cos I was expecting WSW and I don't like WSW at Melville all that much. As it was the direction was good, there were some flattish patches and some nuking gusts. I went for comfort on the 90 Gladiator + 6.6TR7 + 27 Tribal Weedy combo, which was a sweet set-up in the gusts. A bit of time standing around waiting for the gusts, but the water temp is not too cold at the moment, so it wasn't too much of a chore. I needed a couple more smokers to round out the average, which includes a 32 and a couple of 33 10-sec runs, but happy to see 39 on the screen after my best run (37.7 10-sec). 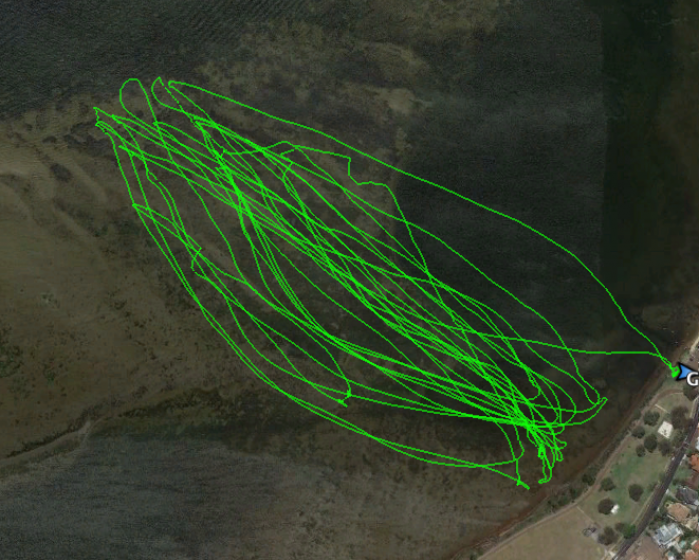 I got mega lit in a 35 knot gust around 11:30, but the fin let go and after sliding sideways for a bit I bailed. Great little sesh and happy to share some runs with Slowy and Pete. Arrived for the early shift, the tide was full which made for some very choppy conditions. After a few runs with the 6.2 I decided that need to get a bit more control as I just could not hold on in the gust. the 5.4 was perfect and made for a much better setup. Not as smooth as was hoping but certainly a fun session at Fangy's who generously left the gates open for all to enjoy.Started on the 87L and then gave the speedboard a go for the last hour. Wind was strongest in the morning with some big gust. By noon the tide started to drop and the wind started to ease back but was still blowing hard. Weedbergs required close attention and two 'slow' over the handle bar dismounts. Horribly unfit but good to get out with a good bunch. Good to have a sail with the Busso boys as well. Great time in the slime with some great characters. Always a good day when theres plenty of PBs to go around too. Nice to see the Busso guys making the trip up to play in Fangys playground. Neil, Claude, Stevie and a few locals braving the madness. I tossed up between a nap and a sail but the sail won, and I am glad it did. What an awesome session. My first speed sailing session in sooo long, and it felt good, even if I was a bit tentative for a while. Later I got more adventurous and I was hoping for a Melville 30 and got verrry close with 29.93 but the 30 remains elusive. Started on the Mistral 91 and 28 fin and changed down to the Manta and 23 weedspeed when the former fin started touching the bottom. Top speed was on the Mistral, but most of the 10 sec runs were on the Manta. My fastest speed since the March second this year (and gee it felt good). It was lovely to share the session with Boz and Kenny. So nice to see you guys again! 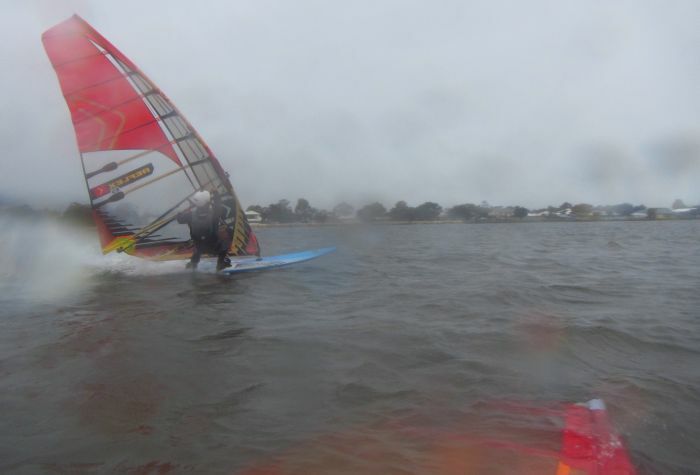 Danny Pedarosa compares windsurfing to MotoGP...out there today it was more like Supercross. Got up early and headed to dutchies for a wave session. Was overdone on the 4.2 and 80 litre board so pretty much in survival mode most of the time. Happy that i got to try out my 66 litre JP board for the first time which was more comfy but still overpowered in the gybes. Went home for lunch and picked up the slalom gear and headed to lucky bay. Wind was still blowing and had the best runs early in the session when the wind was strongest. Good to share the stoke with captain and Boz. 5m overdrive, mistral 91, 25 tribal ws. Double session, early morning start 6:30 on the water at Melville, not the best start was gusty as all mighty, chop every where you looked speeds in the 33, off the water by 8:00 as it was sunday and had church duties prayed for flatter water must have worked I see slowie got a 42, stayed too long and wasn't back on the water till about 2ish, so differant to the morning session but I think I just m issed the best off it, decided to throw a couple jibes in just for good measure as I knew the boys down coods would have layed some stonking turns. Awsome speed for melville pointy, and a cracker PB Tim I am sure it made the drive worth while. I am interested to see what Boz returns, he was out early this morning and ducked out for church I think but was back on the water when I left. Stonking alpha Lunny Tidy speeds as well. A very pleasing boost up the ladder, well done team, we improved in every catagory except distance today, and it really was not a distance day! Sizzling alpha, Lunny, and a smoking nm, just pipping Boz' nm earlier in the week. Are you in the KA72 nm competition? Congrats on the PB and also a top 5 5 X10. You were flying today! Tim, welcome back to the speed lane, and congratulations on a PB nautical mile. That must have felt fast, and rather like sailing through a minefield with all those weedbergs. Super 2 sec PB, Windtech, and a top 3 5X 10 as well! I heard you were testing a new fin - I'd say it is a winner! Great session Tailwind, with a top 5 2 sec and 5X10 in challenging conditions. A top 3 alpha for you Kenny! Well done! Thanks for throwing in some alphas Boz, Nice one! Nice river naughty, JJ. Plenty of good nautical miles today. Congrats to all , fairly challenging conditions but especially Anita. Pretty good for a lightweight ,a dogs hair off 30. Thanks Neil, speaking of light weight, someone said to me today "I hope you are putting on weight" - which is a very unusual thing for a lady to hear and rather confusing - then I realised he meant lead in the weight vest! But no. No lead today. Awesome turn and burn Lunny and a PB Nauru for Flatchat well deserved you looked fast today. Great turn up team. �Send it Sunday�. Well done Neil and Craig on the PBs. Big shout out to Craig on that burning turn for missing all the weedbergs and fangy snort in the limited flat stuff. Sweet speed there Greg. Melville can deliver sometimes. Congrats on the PB's Lunny Tim and Neil. Huge Swan speed Greg. Great speeds from everyone today given the conditions. Congrats Neil, Tim and Lunny for the smoking PBs. JJ yes the 66 turns on a dime. Just need to get used to it over the summer. Awesome outing team! Great numbers and PBs Glad to see the wintry weather didnt deter you. I battled the weedmonster at Dutchies for a few frothies. Hope to catch up with a few more of the team before the end of the month. Glad you got a sail Anita.Thats an impressive speed for chop. Thanks Sue. It was not too choppy on the inside of the sand bar by the time I got there. Thanks Maree. It was the first decent sail I have had for months. It felt really good. A bit tired today but not too sore. An awesome session, team! Top class mile, alpha and 2sec PBs Tim, Craig and Neil! Pinnaroos crushing it this October!!! Snake, We will do even better when you are back on the water!